Festival of Hope is about stories. It’s about craftsmen, artisans, farmers—people our God created and loves deeply. It’s about the power our purchasing decisions have to employ parents, empower women, and restore dignity to our brothers and sisters around the world. What do you think of when you hear the word “Haiti?” Poverty, natural disasters, orphans? What about hope, thriving, dignity? In preparation for our trip to Haiti in 2017, our team read the book When Helping Hurts, and many of us viewed the video Poverty, Inc. The story we heard of Papillon and how it got its start to alleviate the issue of orphans was very touching to me. A woman in Olympia (Shelley Jean) went to Haiti to adopt a child, because like many of us, she had heard that there are so many orphans. In the process of waiting to adopt him, she was shocked to find out that the child’s mother came weekly to bring treats and see her son. Shelley then found out that 80% of the orphans in Haiti have one or both parents living, but they simply cannot afford to care for them. Many mission groups go to build and maintain orphanages, but how many go to create jobs for the parents so there won’t be a need for all the orphanages? Out of this came the idea of Papillon. Shelley started by teaching four women to make jewelry and sold the pieces on Etsy. 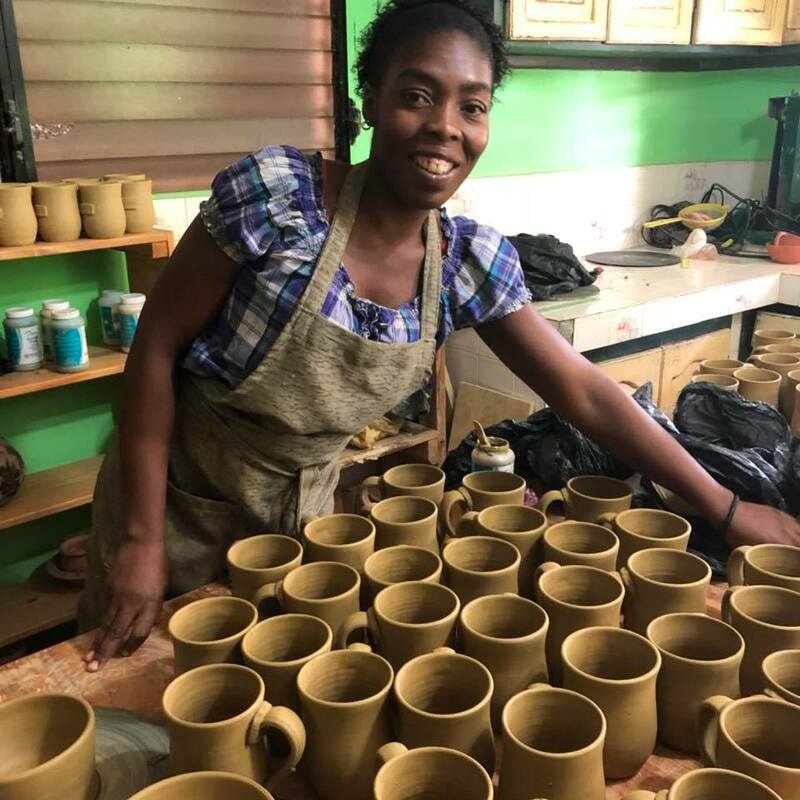 Fast forward, she now employs 250 mothers and fathers at her shop in Port-au-Prince where they learn skills of making jewelry, pottery, silk screening tee-shirts, sewing, and computer skills. There is a delicious open-air café called the Clay Café and an on-site daycare. We had the joy and privilege of visiting Papillon while in Haiti. We found amazing artisanal products at the gift shop first, then we had a tour by “Tricky,” a Haitian man raised in the US. I was moved to see all these parents working together to create something new out of something discarded and unusable by our standards. The employees were happily chatting away when we came in, some shy, and others willing to have their picture taken. I witnessed a sense of pride and dignity in their being able to provide for their families. To make these items, the indigenous clay is dug up, sifted, and used to make one of a kind jewelry, crosses, Christmas ornaments, and mugs. The colors painted on the clay are reflective of the rich Caribbean culture, inspired by the hard-to-miss tap-tab buses with their bright colors, Scripture, and tributes to celebrities! Discarded glass is crushed by hand and sifted until it becomes like sand. It is then placed in molds to create beautiful medallions and beads. Soup and soda cans are transformed into custom jewelry and custom word art. Cereal boxes, political posters, and paper of all kinds are rolled into beds to make necklaces, earrings, and bracelets. They also sell amazing steel art, made from 55 gallon drums. These are cut, pierced, and bent to make shapes. Intricate detail is added by hand to make crosses, birds, wall hangings, bowls, etc. The motto at Papillon is Degaje which means “make do or use what you have.” It’s fitting. One of the most rewarding and emotional areas for me was our visit to the daycare knowing that these little ones get to go home with their parents at the end of the work shift. They definitely wanted their pictures taken and knew to turn the phone around to see themselves! Papillion gives parents the hope and dignity of raising their own children rather than the heartbreak of abandoning them to an orphanage because they don’t have any means to provide the basics for them. It is amazing to me how one woman could change the lives of so many by realizing that charity is not the solution to the orphan problem in Haiti. Giving mothers and fathers the opportunity to make beautiful, handcrafted items that bear the fingerprints of their story empowers them to be a part of their own success. These lovely products can be purchased at our Festival of Hope November 17-18 (with early shopping at Ladies Night and the Women’s Breakfast November 16 and 17). I have always loved shopping at our Festival of Hope believing people should earn a fair wage for their crafts. Representing Papillon and telling their story is an honor. Click on the blog titles to read more from our pastors.